Iâ€™ve driven over the D Street bridge that crosses the Petaluma River many times and I always made a mental note to draw the tugboats anchored along the river bank someday. Finally, over this past Labor Day weekend, I found the time. I arrived early in the morning while the sun was still obscured by fog and parked myself in the middle of the walkway along the D street bridge looking southeast. About a half an hour into the drawing, I heard the bells of a railroad crossing but didnâ€™t pay much attention to it. After a minute or two, a man on the other side of the bridge called out to me to get off the bridge. Thatâ€™s when it dawned on me that I was standing on a draw bridge! I grabbed my art supplies and ran to the river bank. Sure enough, two large gears attached to the side of the bridge rotated it upward. Shortly thereafter, three sailboats with their tall, sail-less masts motored under the bridge and down the river. When the bridge lowered, I resumed my location on the bridge and continued drawing. 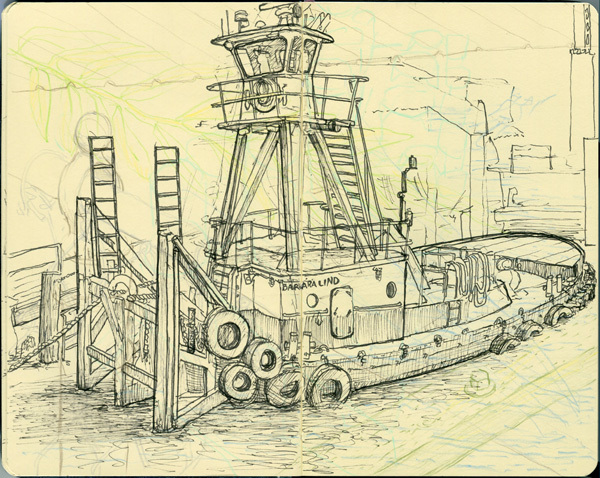 Durring the hour and a half it took to sketch this drawing, the bridge was raised three times for boats to pass. September 7, 2010 March 29, 2013 Richard SheppardComments are off for this post.